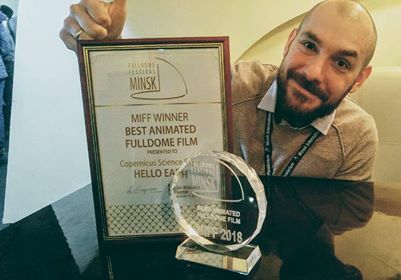 I am very pleased to inform you that “Hello Earth” won the Best Animated Fulldome Film Award at the First Minsk International Fulldome Festival which was held in the beginning of November in Minsk. I couldn’t be there, but I would like to say Thank You to festival organisers for fantastic communication and jury, of course. Maciej Rasala, supervisor animator . Thanks Maciej !